The second lecture of the Hindoo monk, Swami Vive Kananda, was given last evening at the Unitarian church to a large and very appreciative audience. 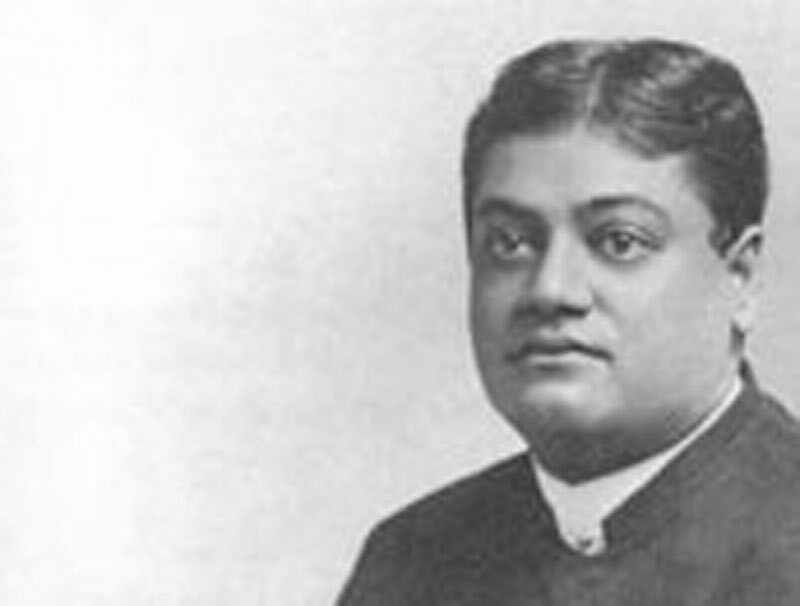 The expectation of the audience that the speaker would enlighten them regarding "Hindoo Philosophy," as the lecture was entitled, was gratified to only a limited extent. Allusions were made to the philosophy of Buddha, and the speaker was applauded when he said that Buddhism was the first missionary religion of the world, and that it had secured the largest number of converts without the shedding of a drop of blood; but he did not tell his audience anything about the religion or philosophy of Buddha. He made a number of cute little jabs at the Christian religion, and alluded to the trouble and misery that had been caused by its introduction into heathen countries, but he skilfully avoided any comparison between the social condition of the people in his own land and that of the people to whom he was speaking. In a general way he said the Hindoo philosophers taught from a lower truth to a higher; whereas, a person accepting a newer Christian doctrine is asked and expected to throw his former belief all away and accept the newer in its entirety. "It is an idle dream when all of us will have the same religious views," said he. "No emotion can be produced except by clashing elements acting upon the mind. It is the revulsion of change, the new light, the presentation of the new to the old, that elicits sensation." The Brahman monk, Swami Vive Kananda, again lectured last evening at the Unitarian church, his topic being "Hindu Philosophy." The speaker dealt for a time with general philosophy and metaphysics, but said that he would devote the lecture to that part pertaining to religion. There is a sect that believes in a soul, but are agnostic in relation to God. Buddahism [sic] was a great moral religion, but they could not live long without believing in a god. Another sect known as the giants [Jains] believe in the soul, but not in the moral government of the country. There were several millions of this sect in India. Their priests and monks tie a handkerchief over their faces believing if their hot breath comes in contact with man or beast death will ensue. Among the orthodox, all believe in the revelation. Some think every cord in the Bible comes directly from God. The stretching of the meaning of a word would perhaps do in most religions, but in that of the Hindus they have the Sanscrit, which always retains the full meaning and reasons of the world. The distinguished Oriental thought there was a sixth sense far greater than any of the five we know we possess. It was the truth of revelation. A man may read all the books on religion in the world and yet be the greatest blackguard in the country. Revelation means later reports of spiritual discoveries. The second position some take is a creation without beginning or end. Suppose there was a time when the world did not exist; what was God doing then? To the Hindus the creation was only one of forms. One man is born with a healthy body, is of good family and grows up a godly man. Another is born with a maimed and crooked body and develops into a wicked man and pays the penalty. Why must a just and holy god create one with so many advantages and the other with disadvantages? The person has no choice. The evildoer has a consciousness of his guilt. The difference between virtue and vice was expounded. If God willed all things there would be an end to all science. How far can man go down? Is it possible for man to go back to brute again? Kananda was glad he was a Hindu. When Jerusalem was destroyed by the Romans several thousand [Jews] settled in India. When the Persians were driven from their country by the Arabs several thousand found refuge in the same country and none were molested. The Hindu, believe all religions are true, but theirs antedates all others. Missionaries are never molested by the Hindus. The first English missionaries mere prevented from landing in that country by English and it was a Hindu that interceded for them and gave them the first hand. Religion is that which believes in all. Religion was compared to the blind men and the elephant. Each man felt of a special part and from it drew his conclusions of what an elephant was. Each was right in his way and yet all were needed to form a whole. Hindu philosophers say "truth to truth, lower truth to higher." It is an idle dream of those who think that all will at some time think alike, for that would be the death of religion. Every religion breaks up into little sects, each claiming to he the true one and all the others wrong. Persecution is unknown in Buddahism. They sent out the first missionaries and are the only ones who can say they have converted millions without the shedding of a single drop of blood. Hindus, with all their faults and superstitions, never persecute. The speaker wanted to know how it was the Christians allowed such iniquities as are everywhere present in Christian countries.